During this field test for the KWC Mdoel 75 Tac BB Pistol, I put 5 shots through my Chronograph using a brand new CO2 and 5.1 grain Umarex zinc Coated BB's. I averaged just a slight bit under the factory claimed 325 fps but not by much coming in at 315 which was pretty good considering it was far from a warm summer day, perhaps about 15 Celsius? Stepping back to my 30 foot mark, I shot 10 rounds at a paper target using a semi rested position (Sand bag up front and standing in the back). There was a 7 shot noticeable 1.5 inch group with 3 of the 10 shots hitting just outside that tighter group stretching it out to a bit over 2 inches. I was shooting a bit high and the left wiht the KWC Model 75 Tac Blowback BB Pistol but this could easily be corrected by trimming up the full adjustable rear sight. 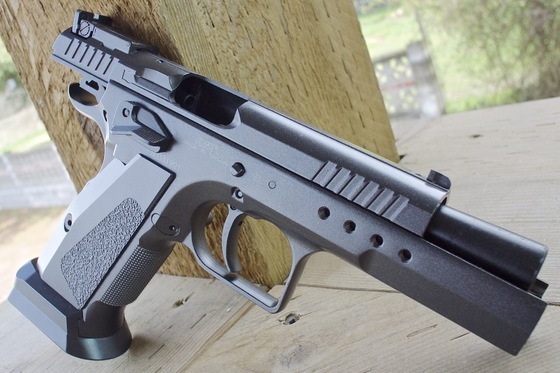 Just like the Cybergun Tanfoglio Gold Custom, the KWC Model 75 Tac Blowback BB Pistol has a very smooth, short and light single action trigger along with a nice crisp blowback action and a great overall balance. With this none sight rail and compensator version you do get the rear fully adjustable sight along with a more compact overall pistol that performs in much the same manor as its larger brother. Either version will allow for very quick and accurate shooting none the less.